A small evergreen perennial plant with small leaves only about 5mm long and small white/pink flowers loved by bees. A pleasant aromatic smell. Traditionally one of the herbs used in bouquet garni and savoury dishes. The essential oil contained in thyme, thymol, acts as a mild antiseptic and expectorant and is said to aid with respiratory ailments, coughs and colds, throat and gum infections. As a salve it can help soothe miscles and rheumatism. 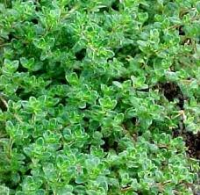 Thyme was used as an antiseptic as long ago as the Sumerians. Ancient Egyptians used it as part of the mummification process. Greeks and Romans used it as massage oil , bath oil and incense as well as in medicinal remedies. 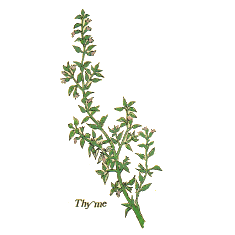 In the 19th century thyme was used to discinfect hospitals.